There are many terms used to describe ways in which animals can help rehabilitate and heal persons with special needs. 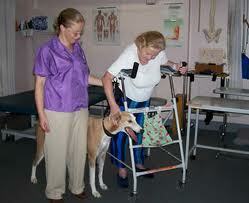 These include "pet therapy", "pet facilitated therapy", or "animal-assisted therapy". Pets can help people with a variety of mental, emotional and physical disabilities. 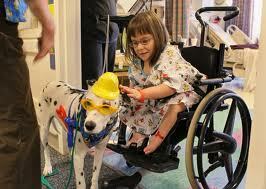 Fish, birds, pocket pets, rabbits, cats, dogs, horses have all been employed in pet therapy. that make them so therapeutic? Warm and fuzzy: Animals are warm and fuzzy and alive. Being able to hold and pet another living creature can provide a great deal of comfort. Nonjudgmental: Pets are nonjudgmental and don't criticize. So what if the new recipe turned out inedible. So what if you accidentally mowed down the rose bush. So what if you made a lousy decision. Your pet will think no less of you. Pets accept us the way we are. Trusting: Animals are often very trusting and can help build trust in ourselves and others. By watching them we learn we also are dependent and must rely on others. Unconditional Love: Pets can often tell when their owners are sad or upset and respond in an attentive way. It's really quite amazing how they can pick up on a person's emotions. Listen: Pets are great listeners. They don't interrupt. They don't feel obligated to share their opinions. They are interested in a variety of topics. Help us feel needed and important: It helps to know we are needed. Adopting an animal from a humane shelter can certainly help you feel that way. A pet's welcome upon coming home from a hard day's work, or even a short shopping trip can be the best part of the day. We may have had a horrendous day at work, or ignored by a store clerk, but our pets are happy to see us. And they help us feel needed as we provide them with food, water, grooming, and exercise. Clowns: Some pets, whether they try to or not, can be real clowns. We enjoy watching them and joining in with the play. We allow ourselves to act much sillier in front of our pets than in front of our friends. Pets do not play to be competitive, but just to have fun, which is refreshing in today's society. With these qualities, pets can act as co-therapists for a variety of people with special needs. animal co-therapists can help with? Children with Down's syndrome and other developmental disabilities can benefit from interactions with animals. Many special education classrooms have a variety of animals, and may have visiting pets as well. The pets can help them learn about nutrition, gentleness, following instructions, and how to care for other living things. The Quakers initiated the use of pet therapy for the mentally ill in the 18th century. Hospitalized patients with a variety of psychological diagnoses who have pet therapy respond well and are less anxious. and helps build rapport between the therapist and the patient. 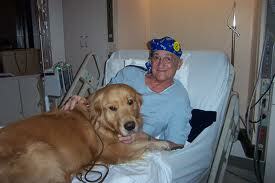 When the patient sees the therapist with a pet, the therapist already is viewed "safer" in the eyes of the patient. The animals can also sense the needs and respond to persons with mental illness in ways the therapist cannot. Children who are emotionally ill respond to the unconditional and nonjudgmental quality of animals. They feel the animal "listens and understands". In believing the animals care for them, they feel needed, important and loved. They then become capable of taking the risk to trust and love. Pets can assist the physically handicapped in a variety of ways. Therapeutic riding is being used for persons with cerebral palsy, muscular dystrophy, multiple sclerosis and others with diminished motor control. It helps to improve their posture, balance, mobility and function. It also provides significant emotional and cognitive benefits. 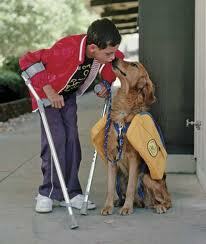 Physically handicapped pets have been terrific role models for persons with physical disabilities. They help the person understand, "if a dog can do it, so can I." Persons with terminal illnesses such as cancer, AIDS, and organ failure, and those who are bedridden are less likely to suffer from depression if they have animals around them. The animals bring a level of comfort and support unique to them. 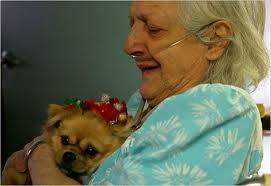 Pets can have positive effects on residents of long-term care facilities. Interest in surroundings, mental health, activity, social interaction and communication are often improved. The use of pets as part of the rehabilitation efforts for children considered to be "at risk" for trouble with the police or school has shown promising results. Facilities may include cows, goats, horses, dogs and cats on their therapeutic staff. Again, the animals are nonjudgmental and show unconditional acceptance and love. The youth learn responsibility and trust, have someone to talk to, and come to feel needed and worthy. Animals seem to be able to bring out these qualities in the youth almost without effort. 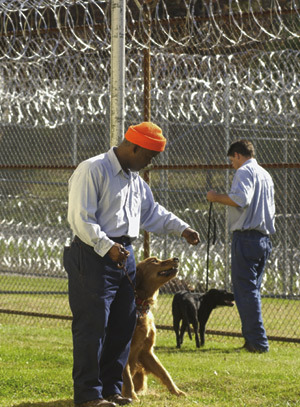 Animals have been used in a variety of prison settings to help prisoners learn confidence and teach them new skills. Again, they become responsible for the welfare of another living being, which can give them a new outlook on life. In one prison, animals presented to the humane shelter are taken to the prison to be bathed and groomed. The prisoners receive a dirty, matted, smelly creature and give back a clean, handsome and much happier animal. There ability to better the life of another living being gives them an improved sense of self-esteem and self-worth. They can then go on and improve their own lives. As we learn more about the therapeutic effect of animals on people, there will be more and more people who will benefit from contact with pets. They have much to give and offer it freely. Allen, KM; Blascovich, J; Tomaka, J; Kelsey, RM. Presence of human friends and pet dogs as moderators of autonomic responses to stress in women. Journal of Personality and Social Psychology. 1991, Oct;61(4);582-589. Barker, SB; Dawson, KS. The effects of animal-assisted therapy on anxiety ratings of hospitalized psychiatric patients. Psychiatric Services. 1998;49(6): 797-801. Beck, A; Katcher, A. Between Pets and People. Purdue University Press, West Lafayette IN; 1996. Fick, KM. 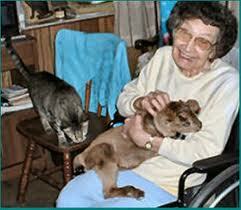 The influence of an animal on social interactions of nursing home residents in group settings. American Journal of Occupational Therapy. 1993, Jun; 47(6):529-534. Kongable, LG; Buckwalter, KC; Stolley, JM. The effects of pet therapy on the social behavior of insitutionalized Alzheimer's clients. Archives of Psychiatric Nursing. 1989, Aug; 3(4);191-198. Lamb, L; Dziegielewski, S; Leon, A. Pet-human bonding: Results of a survey on health and well-being. The Social Work Student. 1998;1: at http://www.uclan.ac.uk/facs/health/socwork/swonweb/journal/issue1/pethum.htm. McElroy, SC. Animals as Teachers and Healers. Balantine Books, New York NY; 1997. Nagengast, SL; Baun, MM; Megel, M; Leibowitz, JM. The effects of the presence of a companion animal on physiological arousal and behavioral distress in children during a physical examination. Journal of Pediatric Nursing. 1997, Dec;12(6);323-330. Raina, P; Waltner-Toews, D; Bonnett, B; Woodward, D; Abernathy, T. Influence of companion animals on the physical and psychological health of older people; an analysis of a one-year longitudinal study. Journal of the American Geriatric Society. 1999, Mar;47(3):323-329. Serpell, J. In the Company of Animals. Basil Blackwell Inc., New York NY; 1986. Click here to learn about one of our local organizations that uses (Equine) animal therapy for emotionally needy children.